Before we get to talking about Vegan Spinach & Ricotta Cannelloni, I have to celebrate a little. You see, it’s my blog’s Birthday!! 4 Years ago I posted my very first recipe on It Doesn’t Taste Like Chicken. Woot woot! I remember getting 3 views that day, which were all from my family. My blog now receives 10,000+ views daily. I posted my dinner, which was spaghetti with tomato sauce, and jotted down the recipe which was written in no particular order, without any ingredient quantities, completely vague, and the photos were taken with my geezer of an iPhone at night under kitchen lighting, just before eating my meal. Now, I’m completely nit picky about measurements and instructions, I write all my recipes during the day, test them multiple times, use natural lighting as well as professional photography lighting, a proper DSLR camera, and my food is always cold by the time I get to actually eating it. I was working at a job I hated, was nervous about informing people I went vegan and hoped I could avoid the subject all together, and felt a little directionless in life. 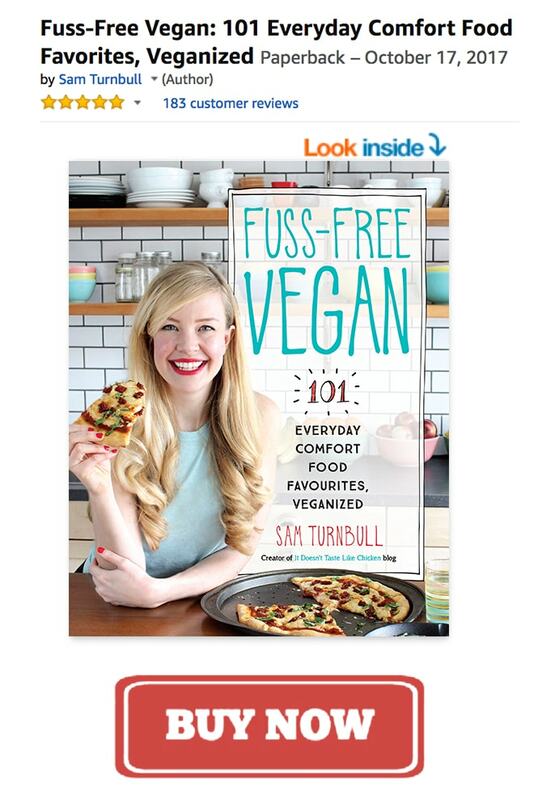 Who knew that in just 4 years I would be working full-time as a food blogger, that I would have finished writing and photographing my first cookbook, am the loudest and proudest vegan I know, and truly feel like I have my dream job that I didn’t even know I was dreaming about. My oh my what a lot has happened in 4 years! 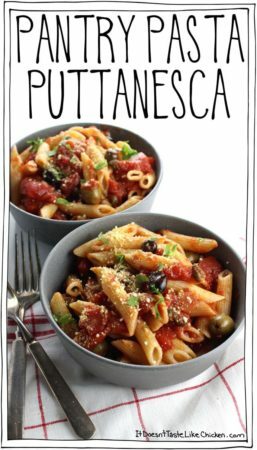 In celebration of 4 years, I thought I should make a pasta recipe, since that’s how this whole journey started. Vegan Spinach & Ricotta Cannelloni for the win! Fresh spinach and basil mixed with creamy dreamy easy to whip up ricotta, stuffed into cannelloni pasta, and coated in tomato sauce. Oooeee! What can be more delicious than that? This is one of those recipes that you could serve to anyone and they would never know it was vegan. It’s just all sorts of delicious, and that’s just the way I like it. 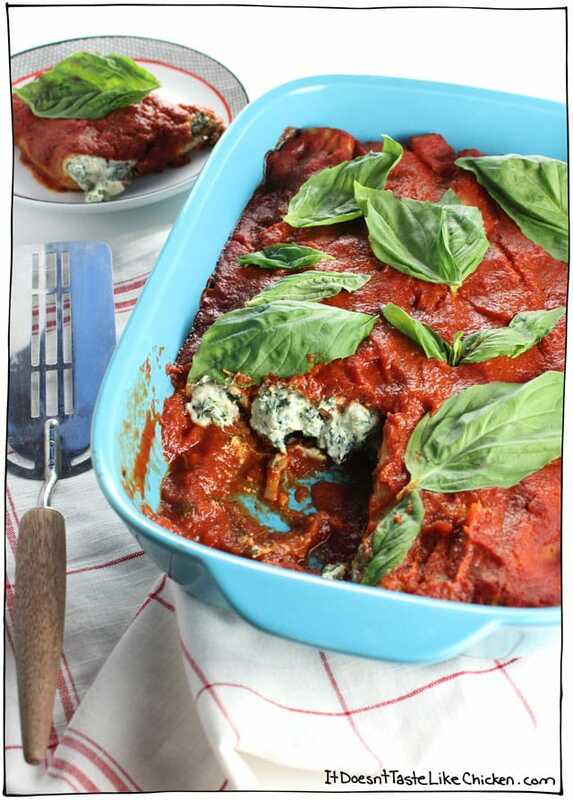 Perfect for a fancy occasion, but so yummy, you’ll probably want to make this Vegan Spinach & Ricotta Cannelloni more often than that! 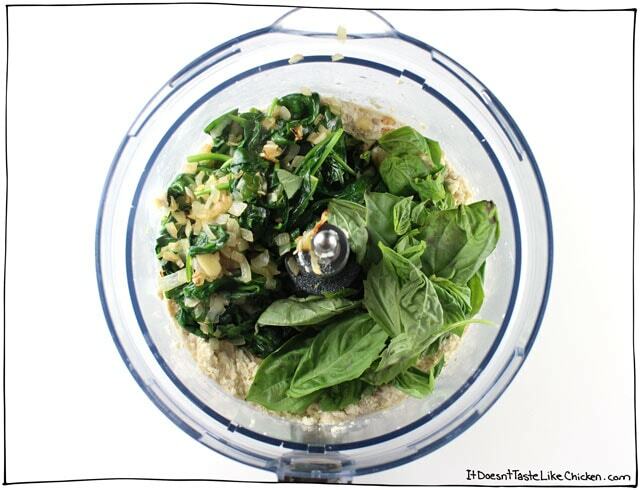 Add the cooked spinach and onions to the food processor with the ricotta. Add in the basil, reserving some basil leaves for garnish. *I love my Quick Vegan Tofu Ricotta in this recipe but my Vegan Cashew Ricotta or Macadamia Ricotta would both work wonderfully as well. Pulse a couple of times, stopping to scrape the sides as needed until the ricotta is spotted with green throughout. Scoop the ricotta mixture into a large sealable bag and cut off the corner. Alternatively, use a pastry bag. Fill the cannelloni noodles by squeezing some of the ricotta into one end of a noodle, flipping the noodle over and filling from the other side. Don’t worry about these being perfect, they are going to get smothered in tomato sauce anyways, so any messes will be hidden. Lay the noodle in the baking dish with the sauce in a single layer. Repeat with the remaining noodles until the dish is full and the ricotta is used up. Cover with the remaining tomato sauce making sure each noodle is coated in sauce. Bake until the cannelloni are tender and the sauce is hot. Remove from oven and garnish with basil leaves. Omnomnom! 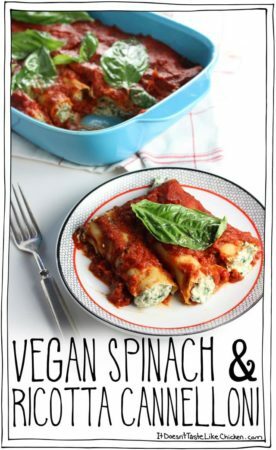 Fresh spinach and basil mixed with easy to whip up dairy-free ricotta, stuffed into cannelloni pasta, and coated in tomato sauce. So delicious no one will even know it's vegan! Heat the oil in a skillet over medium-high heat. When hot, add in the onion and garlic, sauté until the onion begins to soften but doesn't yet brown, about 4 minutes. 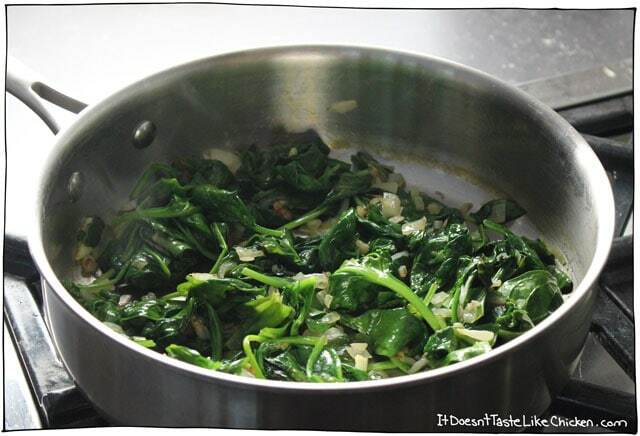 Reduce the heat to low, add in the spinach and cover. Check and stir the spinach every minute until the spinach has wilted, about 4 more minutes. 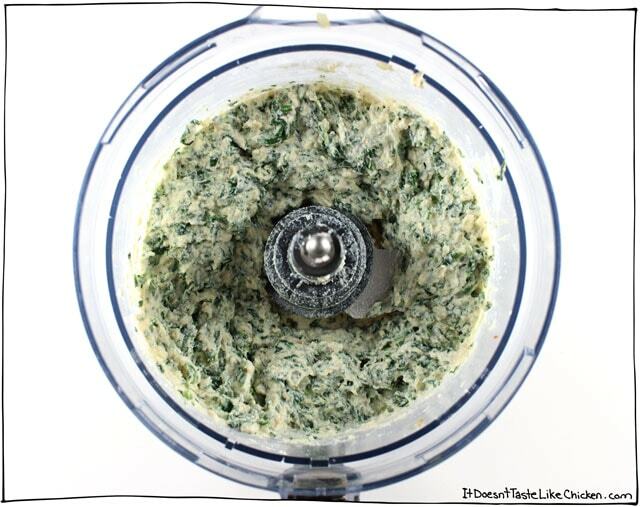 Add the cooked spinach and onions to the food processor with the ricotta. Add in the basil, reserving some basil leaves for garnish. Pulse a couple of times, stopping to scrape the sides as needed until the ricotta is spotted with green throughout. Prepare the cannelloni noodles according to package directions. Mine were the oven ready type, so there was no preparation needed. 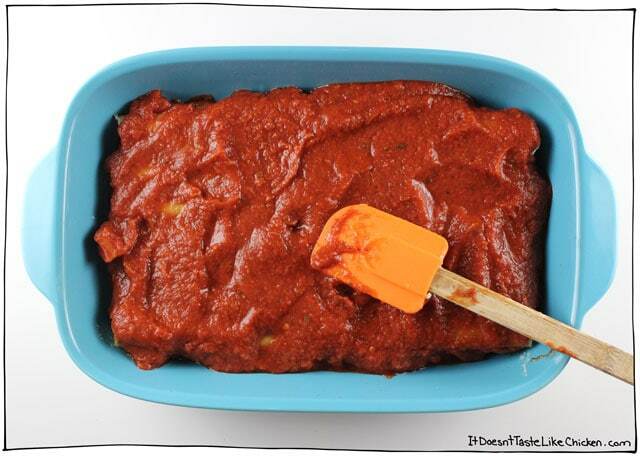 Spread about 1/4 of the tomato sauce in the bottom of a 9" x 13" pan. Scoop the ricotta mixture into a large sealable bag and cut off the corner. Alternatively, use a pastry bag. Fill the cannelloni noodles by squeezing some of the ricotta into one end of a noodle, flipping the noodle over and filling from the other side. Lay the noodle in the baking dish with the sauce in a single layer. Repeat with the remaining noodles until the dish is full and the ricotta is used up. Don't worry about these being perfect, they are going to get smothered in tomato sauce anyways, so any messes will be hidden. Cover with the remaining tomato sauce making sure each noodle is coated in sauce. Bake 30 to 35 minutes until the cannelloni are tender and the sauce is hot. (Alternatively, follow the baking directions on your pasta package, it may vary). Remove from oven and garnish with basil leaves. I love my Quick Vegan Tofu Ricotta in this recipe but my Vegan Cashew Ricotta or Macadamia Ricotta would both work wonderfully as well. We’ve made this a few times now and it never disappoints! 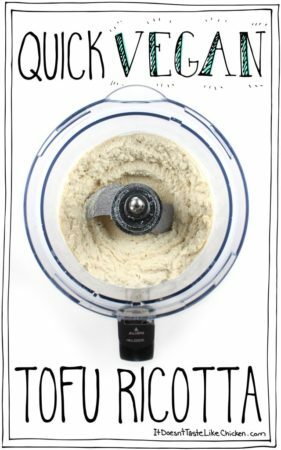 The kids love it and even though the piping into the tubes can be messy, I just do it over a bowl and then scrape any dripping back into the bag at the end. Going to try the tofu ricotta in a lasagna next! I did this recipe last night and was amazing! the tofu ricotta taste so, so good…. I just added a sprinkle of nutmeg when mixing with the spinach and the other ingredients. Thank you so much for this yummy recipe! Sam!! This recipe is AMAZING!!! 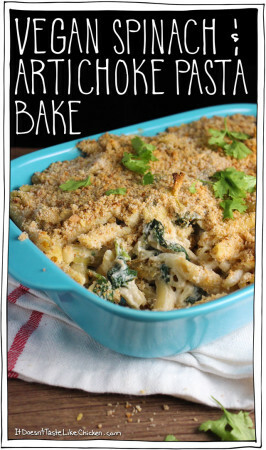 I chose whole grain lasagna noodles over cannelloni noodles- this spinach tofu ricotta mix you make here is absolutely excellent as a lasagne base! I added chopped vegan “meat”-balls and BOOM- a vegan pasta so good I never would have guessed it was vegan just by tasting! You blog is AWESOME, keep doing what you do, your story and your approach to vegan cooking is a huge inspiration to me, both in my journey as a vegan, and as a home cook trying to feed my body better. ❤️ You rock! This is so good!!! Love the tofu ricotta. Have you tried freezing it before? Just wondering how well it would reheat. Thanks! Thrilled you enjoyed it! I haven’t but personally, I am not a big fan of frozen and reheated pasta dishes. I always find they break down too much. This looks so good and I’m sure it is! But my problem with everything now is that my husband, because of a medical condition, is on a very restricted sodium diet (1000-1500mg/day). 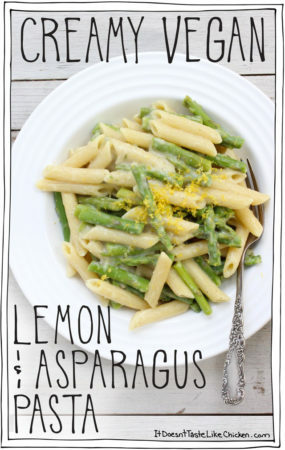 Is there any way to cut the sodium in this and every other recipe without ruining it? He’s getting tired of salads! You could skip the added salt in the ricotta, and make or buy a low sodium tomato sauce. That should help! Just made this! Loved it! This is going to be a regular family favourite now! It’s low fat (only 2 tablespoons of oil) and full of protein and green goodness! 🙂 Thanks so much! 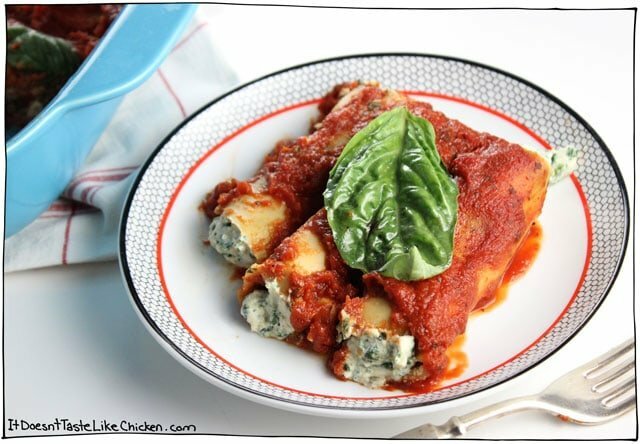 my husband requested cannelloni and as we’re new to this vegan journey i was very hesitant as we had never tried vegan ricotta… but the 5 stars convinced me to take the plunge and I am so glad that we did! This is DELICIOUS. Honestly it’s better than regular ricotta cannelloni. It stays moist and even my kids loved it. We only did one layer which was plenty to feed the 4 of us (my girls are 7) and we had enough filling to make a batch for 2 to freeze. we’re going to try the Cashew filling next time but we LOVED the tofu one. Yum. I made it and it is so delicious BUT what a mess. The tofu filling was way too smushy and leaked out of the pastry bag all over the place. Since it wasn’t firm enough I couldn’t fill the the tubes entirely either. Any suggestions?? Yes, I used extra firm tofu. It was a little warm. Should I refrigerate the mixture to firm up? Do you think that will help before filling? Thanks! Hmmm bizzare, it should be quite thick as in the pictures. Perhaps different brands of tofu have more liquid in them. I would try pressing the tofu first, to get out as much water as possible, and adding the lemon juice to taste. 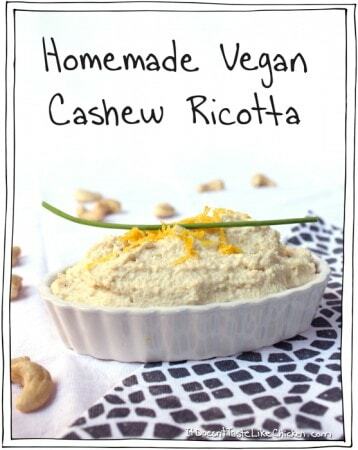 You could alternatively try my cashew ricotta. Hope that helps! I am pretty new at this and thank you SO much. Your recipes are a godsend. What to do without dairy!? What to make after work when I’m tired and don’t feel like a lot of effort? Oh, thank you so much for easy anwers. I used silken tofu instead of the cashew ricotta and it was delicious! Thank you. So happy you enjoyed it, Megan! Congrats on the 4 year birthday of the blog. (Just a month and 3 days older than my daughter!) Can’t remember when I found IDTLC, but probably close to the beginning. I hang around because you come across as a compassionate, non-judgmental, non-preachy, passionate vegan gal who creates amazing and easy recipes that just always work! Your enthusiasm, joy and humour are infectious. Anyway, onto this recipe… I have been making a similar recipe for a few years now and was super excited to give your version a try. 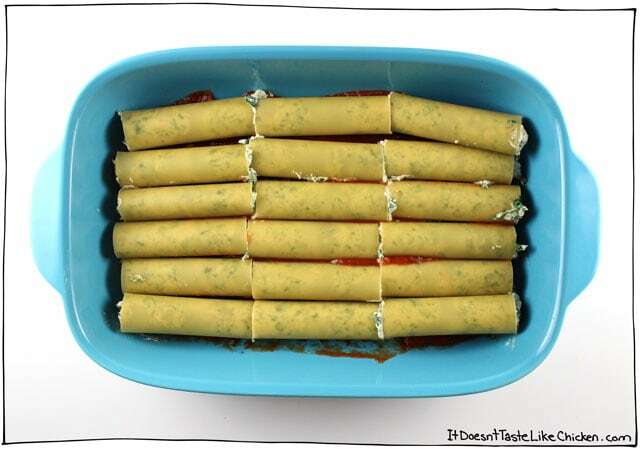 I too use ready-to-bake cannelloni, which is the best since the tubes don’t split if you accidentally overfill. 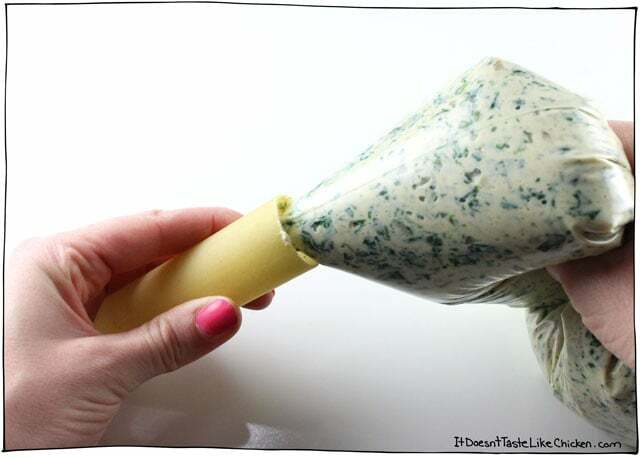 I absolutely LOVE the idea of filling a seal-able bag and cutting a corner to fill the cannelloni. This recipe is so easy, yet looks super fabulous, tasty, and very easy to clean-up when using the bag! Three for three from this busy mom! Congratulations on 4 years Sam! It’s awesome you are now doing this full-time! Seeing your first post, it’s crazy how much your photography skills improved over the years, as well as your recipe writing. I can understand why so many people are following you, your recipes are always easy to make and super tasty 🙂 The first recipe I made from your blog is your popular sweet Korean red lentils dish, and it didn’t disappoint, everyone loves it and I still make it very regularly! I pre-ordered your cookbook a few weeks ago, can’t wait to check it out this winter! 😉 In the meantime, I will definitely try this cannelloni as soon as I get my hands on some noodles! I patted Chickpea for you 🙂 Thank you so much, Lee, very much appreciate it! and woot woot!! Vegan RICOTTA!!! My Sicilian blood is doing a happy dance!! 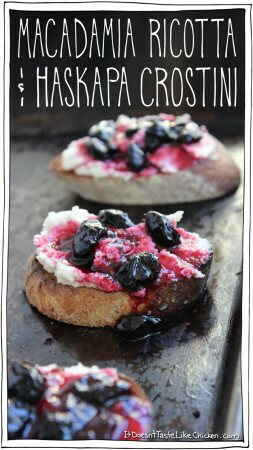 Cant wait to make this and the ricotta !! Do you have a vegan recipe for mozzarella? I will have to check your blog. THANKS SAM!! I am so glad I found your blog and Im thrilled for you that it is such a success! Havent tried it yet, but giving it five stars anyhow!! Happy Birthday to your blog Sam! It’s my favorite one! This recipe looks amazing…OMG!!! We’re on vacation right now but I will absolutely be making this when we get home. Congratulations! And thanks for taking us on your journey with you. I don’t feel like I could have provided vegan meals to the family without your virtual support. Our daughter is heading off to overnight camp soon where there aren’t a lot of vegan options. She’s requested a couple of your recipes (“mom, can you triple that chickpea curry recipe?”), made ahead and frozen, so she can heat them up once at camp. Luckily your recipes are easy and so tasty. You’ve made being vegan so much more fun! Can’t wait for the cookbook. Thank YOU! Congratulations, Sam! I for one am so glad you started your blog––it helped me immensely in becoming vegan for life. I recommend it all the time and am frequently one of those 10,000 daily viewers. Thank you for all you do! vegan for a few years. Keep the recipes coming…. I’m hungry! !